Hot chocolate was that special treat we got to have after school when it was too gray and rainy to play outside (which didn’t happen all that often in the Silicon Valley). It was something I could make by myself – I’d just microwave some water in a mug and tear open a packet of Swiss Miss. I especially loved the kind with the tiny little marshmallows that would float on top. I read ingredient labels more often these days and, not to specifically bag on Swiss Miss because they’re not alone in this, but there are a lot of unpronounceable ingredients in those little packets that go a bit beyond “cocoa”, “sugar” and “milk”. And let’s not even get started with the marshmallows. This past rainy weekend I decided to pull out a saucepan and make this treat from scratch. Doesn’t the idea of Stovetop Cocoa with Toasted Homemade Marshmallows just sound like it would be better anyway? Let me assure you that it is. Hot cocoa recipe from the side of the HERSHEY’S Cocoa package. Mix sugar, cocoa and salt in a saucepan; stir in water. Cook and stir over medium heat until the mixture boils; boil and stir for 2 minutes. (NOTE: I found this very convenient to do in the toaster oven, but a regular oven will work as well.) Spray a baking sheet with cooking spray. Arrange the marshmallows on the baking sheet – leave a bit of space between each one to allow for a little spreading – and place the sheet under the broiler. Watch carefully – it should only take about a minute for the tops to develop their brown toasty crust. Remove the baking sheet and set aside to cool for a minute or two. 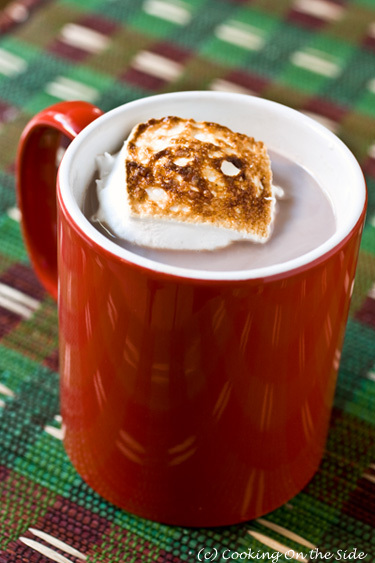 Then, using a spatula, carefully transfer each marshmallow from the baking sheet to your mug of hot cocoa. I always make myself a cup of cocoa when it’s raining! It’s one of those drinks that makes everything better. Oooh…wishing I’d brought some to school today! I was JUST dreaming about homemade marshmallows today! Boy do those look good! I love homemade cocoa, so much better than the package stuff. And homemade marshmallows…yum!